Fitness, Personal Training, Health Coaching, Nutrition, Wellness, Weight Management, Martial Arts, Coaching, Sports Performance and More. NOTE: You can enroll in any of these programs at any time. They do not need to be completed in any particular order. Our programs are open to anyone with a desire to learn and help others. There are no prerequisites. Click on any program below, and enroll now! Become a NESTA Personal Fitness Trainer. Learn about the NESTA System of Personal Training Success, Exercise Physiology, Functional Anatomy & Kinesiology, Muscular Anatomy, Biomechanics, Flexibility, Special Populations, and more. This is your most affordable and fastest way to become a highly qualified personal trainer. NOTE: It is NOT required to complete this course before enrolling in others offered by our schools. NESTA’s Master Personal Trainer is a bundle package containing the Personal Fitness Trainer, Biomechanics Specialist, Core Conditioning Specialist, Functional Training Specialist, as well as the Speed Agility & Quickness Specialist Program. This is a huge savings and a very comprehensive training package. Become a Group Exercise Instructor. Learn how to teach group exercise classes in a variety of formats. Learn how to teach an effective warm-up, cardiorespiratory segment (low-high), sculpting, bodyweight exercises, dynamic flexibility, metabolic HIIT bursts, cool-down and stretch, and more. Learn how to become a Sport Yoga Instructor. This program is a comprehensive online yoga teacher training program for fitness professionals who want to integrate yoga movements into their one-on-one training-group fitness or group exercise programs. Sport Yoga is a comprehensive online yoga teacher training program for yoga enthusiasts, personal trainers, current yoga instructors, and wellness professionals. Learn how you can quickly and easily add yoga to your fitness business and expand your career now. Become a Fitness Nutrition Coach. Learn about optimal nutrition, including proven techniques for increasing energy, optimal health and decreased dependence on medications. Instantly increase your job and career opportunities with this popular professional credential. If you want to help clients with food, diet, weight management and improving the results of their fitness routines, this course is for you. Become a Sports Nutrition Specialist. Learn cutting-edge techniques for increasing sports performance, reducing recovery time, and enhancing the overall well-being of your clients. If you are a personal trainer or specializing in nutrition, this program will complement your credentials. This knowledge will help you with all levels of clients from weekend warriors to world-class athletes. It’s an excellent addition for fitness pros who are seeking CEUs, more knowledge and new career opportunities. Become a Kid’s Nutrition Specialist. You can make a difference in reducing childhood obesity and diabetes by applying the principles in this course. The youth have special nutrition requirements, and you will need to know these to effective help them and their parents. Many coaches/trainers will complete this course in addition to their fitness and other nutrition credentials. Become a Lifestyle Weight Management Specialist. Help your clients achieve their weight loss or weight management goals using the latest proven strategies. More than 50% of Americans are overweight. The number is high, and growing in most other countries. This market is full of opportunity. It’s a smart and easy addition to all other coaching/training niches. 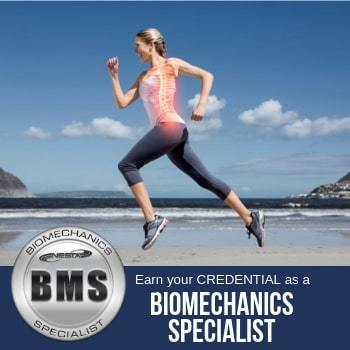 Become a Biomechanics Specialist. Understanding biomechanics, human movement and joint function gives you skills that quickly make you a high-level fitness expert. When you earn this credential, you will put yourself in the top 5% of trainers/coaches when it comes to knowledge of human movement. Your clients will get far better results, and you will get more referrals. Become a Functional Training Specialist. Many fitness training programs sacrifice functionality, and overlook proper movement, to meet a client’s aesthetic goals. Learn how to avoid this mistake. Every sport and every activity has a specific series of movement patterns. You will learn how to improve your clients’ range of motion, flexibility and body awareness. This course provides you will another great opportunity to increase your career success. 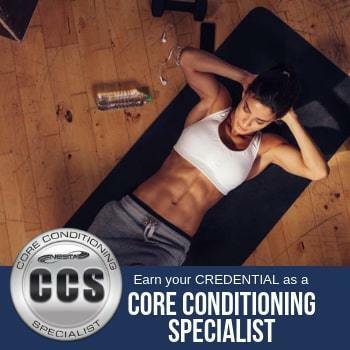 Become a Core Conditioning Specialist. Essential core stability training for fitness pros who demand more from themselves and their clients. All big movements start with the core, and all of your clients want and need to improve core function and appearance. You will become more skilled and marketable and a fitness professional. Become a Metabolic Conditioning Coach. Discover the #1 training system that will help your clients burn fat, lose weight, build muscle, improve cardio and quickly get into the best shape of their lives become the only certified metabolic and HIIT training specialist in your area. This is a very popular courses, and it works perfectly for personal trainers, sports coaches, martial arts instructors and group exercise instructors. Become a Heart Rate Performance Specialist. Effectively design fitness training programs targeting ideal heart rate zones. This course is perfect for personal trainers, sports coaches and group exercise instructors. Whether your clients want to train to improve sports and fitness performance, or simply enjoy a healthier lifestyle, the most effective way to do both is to listen to your body. Become a Speed, Agility and Quickness Specialist. Make your team or athlete faster, stronger, and more agile with or without equipment. If you work with any type of athlete, they will benefit when you gain this knowledge and credential. You will earn a beautiful certification, continuing education credits and extensive skills to help make you a world-class coach/trainer. Become a Physique and Figure Training Specialist. Many clients want aesthetic results, and are not focused on function. This comprehensive training program will give you everything you need to become a highly successful physique and figure training specialist. If you are a fitness pro who offers diet, weight loss, nutrition and similar services, this is your next logical certification. Become a Sports Injury Specialist. Keep your clients safe by learning essential injury treatment and prevention. Personal trainers and sports coaches alike enroll in this program on a daily basis. No other program in the industry gives you this knowledge and important skill set. 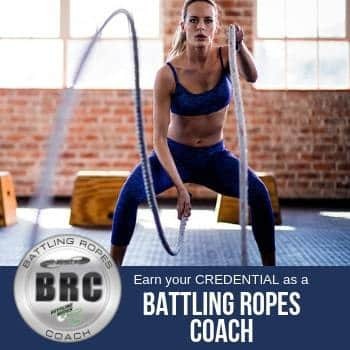 Become a Battling Ropes Coach. You can now become a world-class conditioning expert using Battling Ropes. Developed by legendary coach and strongman, John Brookfield, is the originator all the Battling Ropes Systems globally is a complete strength and conditioning program like no other. There are so many ropes exercises that are never known by 99% of fitness pros. Learn the best-kept secrets from the man who created the entire ropes training movement. Become a Kettlebell Coach. This program is intended to give you the knowledge and skills to successfully implement and instruct kettlebell training with your clients and athletes. The Kettlebell Coach Certification was created to give you a powerful, yet simple and effective, approach to learning and teaching proper kettlebell movements. The benefits of this training are numerous for your clients and your career. Become a Certified Mixed Martial Arts Conditioning Coach. Learn the MMA fitness training and conditioning techniques and science to train top-level MMA athletes, or fitness enthusiasts who want MMA fitness and conditioning programs. Coaches certified through this program have trained UFC World Champions. Many have successful businesses offering a wide range of martial arts fitness-related services. 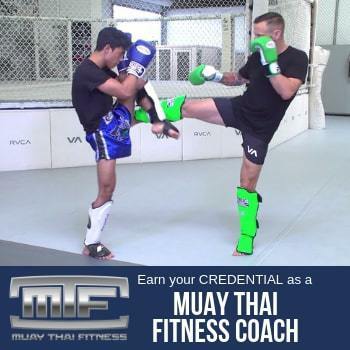 Become a Muay Thai Fitness Coach. The ultimate kickboxing fitness class designed for one-one-one training, small groups and large group formats. Multiple options for small budgets to big box gyms and all points in between. The training course receives excellent positive feedback from graduates all over the world. Become a PURSUIT Coach. PURSUIT has been called a “fitness flash mob” and boot camp 2.0. But, it’s much more than that. It’s the next evolution in outdoor group fitness. Features very low overhead and big monthly revenue. With the new surge of bodyweight training becoming a popular component of mainstream fitness and the “simplification” of exercise, you are in the right place at right time to offer an alternative to cramped gym-based workouts. Instead, you can offer creativity, challenge, excitement and results. Become a Certified Triathlon Coach. Coach and train triathletes to their fullest potential with the most comprehensive Triathlon Coach Certification program in the world. You will receive a complete turn-key blueprint for a successful triathlon coaching career. This is the most comprehensive triathlon coaching course ever developed (science, application and proven business models). Become a Certified Wellness Coach This is the perfect addition for the fitness professional who wants to offer more all-inclusive wellness services to clients. The time is now for you to enjoy this exciting and rewarding career, which offers you personal fulfillment while improving the lives of others. Become a Certified Corporate Wellness Coach. This niche market is exploding with opportunity. It’s a perfect addition for all types of fitness professionals. You will make the difference for your corporate clients, and have a rewarding career that pays you for doing what you love. You will make the difference for your corporate clients, and have a rewarding career that pays you for doing what you love. Become a Certified Life Strategies Coach This is the perfect addition for the fitness professional who wants to offer more all-inclusive wellness services to clients. This course combines the latest advancements in human potential and neuroscience with proven methods of success used by the world’s most productive people. Become a Certified Master Health and Wellness Coach. Learn the proven methods of motivational interviewing, and optimal health and wellness strategies for your clients. This is what you need to best provide your clients help with maximizing health and wellness. You can now dramatically expand your knowledge of brain optimization through proper training, sleep, nutrition, neuro-conditioning and flow state. Start your career a Certified Brain Fitness Coach! It’s time for you to step into your brilliance and show your clients and the world that you are serious about creating world-class results for your clients. Become a Certified Holistic Health Coach. Holistic health and well-being are essential to overall life success. Now you can earn a credential and gain the skills to help your clients achieve this success. You will learn and master holistic coaching concepts, holistic philosophies of well-being, general and complementary health strategies, motivational techniques, your scope of practice and opportunities, best practices for personal and client success, and business strategies and models of the most successful holistic life coaches. The Mind Body Fitness Coach is a great add-on credential for yoga teachers, Pilates instructors, and holistic-minded fitness trainers. You’ll gain a broad knowledge of mind-body exercises and fitness concepts, strategies and methods. You will discover a wide variety of scientifically proven mind-body practices to enhance health, reduce stress and give your clients great joy. The Mind Body Fitness Coach program is designed to give you a wide-ranging perspective on a multitude of options to greatly enhance your knowledge and give you the tools to provide outstanding services to your clients. The Professional Speaker Certification course was created for professionals who understand the compounding benefits of sharing your business or lifestyle idea with large groups of people, and do so in a way that makes you look prepared, intelligent, and convincing. If you are an influencer, online video personality or want to improve your confidence in front of others, this certification is for you. Introducing the most efficient and easy-to-follow Online Coaching Certification ever developed. This is your step-by-step blueprint to build a highly profitable online coaching business. The training course is designed to help ALL COACHES in ALL NICHES take your business online to help clients locally, nationally, regionally and globally. You can become a Certified Personal Fitness Chef and expand your current personal chef business, or add a new profit center for your fitness or wellness business. Some primary careers include: cooking for clients one-on-one in their home or their office. You can also offer healthy dinner parties and special event services. Many chefs cook and coach people in groups to help more people and earn more money per hour. Some chefs provide weekly meal prep service for health-minded customers and athletes. Become a Certified Stress Management Coach. Our stress management coaching program is designed for life coaches, as well as fitness and wellness professionals who want to expand his or her knowledge in the lucrative and expanding field. All coaches must understand stress management and how it’s connected to personal success, sports performance, fulfilling relationships and optimal health. When you earn your certification, you will have the vital skills to become a highly-in-demand coaching professional. You will make a difference in the lives of your clients while enjoying a personally and financially rewarding career as a Certified Stress Management Coach.